Located near the fishing town of Puerto Morelos, the Now Sapphire Riviera Cancun is an unlimited luxury resort perfect for couples, singles, and families. It is only a short, 15 minute ride, from the Cancun International Airport ensuing relatively short transfers. 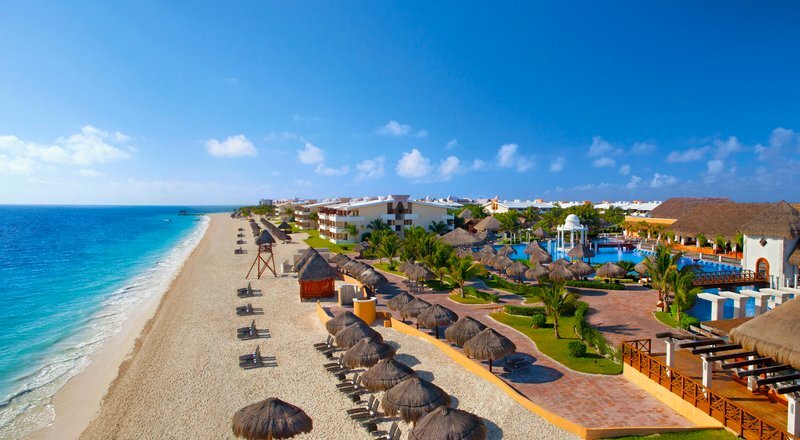 The Now Sapphire Riviera Cancun has 496 spacious junior suites available. Suite amenities include a mini-bar that is refreshed daily, 24 hour room service, cable TV, and more. Preferred Club Suites are also available. Limitless access to five a la carte restaurants, a buffet, a grill, and a café is available without reservations. Choose from a variety of international dishes including Mediterranean, seafood, Mexican, Asian, and French. Five bars and lounges serve unlimited international and domestic top shelf spirts. Guests can pamper themselves at the Now Spa by Pevonia. This on-site spa offers a variety of treatments including many types of facials, massages, body wraps, and manicures. Spa treatment packages are available so guests can relax and revitalize. Many entertainment options and activities are offered that will please the entire family. Options including swimming in one of the four pools as well as playing tennis, soccer, ping pong, board games, golf, and volleyball. Guests can also participate in yoga, bicycle tours, and kid’s club activities. Water sports such as sailing, kayaking, windsurfing, water aerobics, water polo, snorkeling, deep sea fishing, and scuba diving are also available. Additionally, babysitting services are available for an addition fee.